Ussama Makdisi, a professor of history at Rice University, speaks Monday at the Evanston Public Library. Makdisi discussed the origins of sectarianism in the modern Middle East. 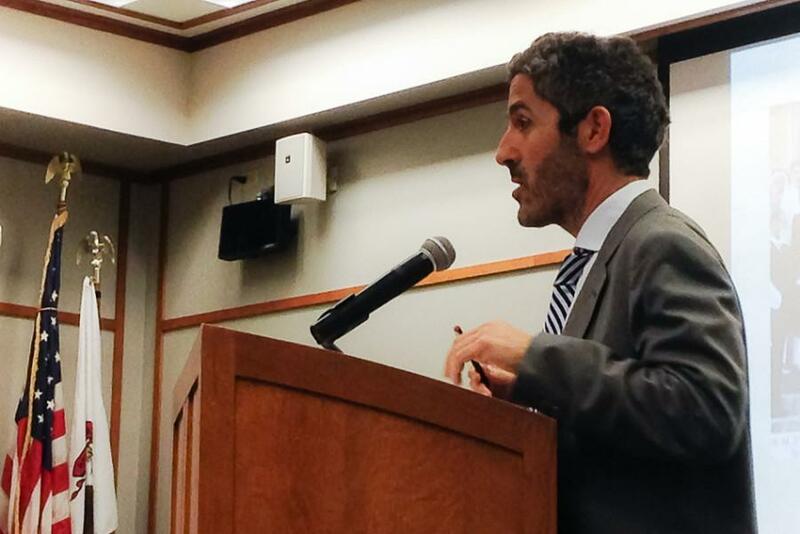 A Rice University professor spoke Monday at the Evanston Public Library on sectarianism in the Middle East and how the region’s history of coexistence has slowly been forgotten. Ussama Makdisi, a history professor and the first holder of the Arab-American Educational Foundation chair of Arab Studies at Rice University, spoke to an audience of about 50 people on the origins of sectarianism in the modern Middle East. The talk was the second event in a series of discussions and lectures organized by EPL, 1703 Orrington Ave., and Northwestern’s Program in Middle East and North African Studies. Makdisi has written several award-winning books about Ottoman and Arab history, U.S.-Arab relations and U.S. missionary work in the Middle East. He discussed how both Americans and people in the Middle East, when thinking only of the Islamic State group, are unfortunately forgetting the region’s “rich history of pluralism” during the Ottoman Empire. Makdisi said the Ottoman Empire allowed, for a time, a society of diverse and unequal systems. However, Makdisi said the rise of nationalism, Western imperialism and reformation changed the empire. Coexistence and diversity gave way to equality and similarity. “Many states, many great empires in the 19th century… including the United States, struggled with new notions of secular equality, new notions of citizenship and struggled to reconcile these notions with longstanding convictions of either racial or religious supremacy,” Makdisi said. Makdisi said that as European powers and outside forces tried to install the new system of equality in the Middle East, violence and conflict started, and conflict is seen today. Lorena Neal, a librarian at EPL, said the talk is part of an ongoing partnership between the library and NU that aims to provide an in-depth look at the Middle East. Gayle Anderson, an Evanston resident, attended the talk and said she thought it was interesting that Western intervention caused more conflict in the region, even though Western nations wanted to help the Ottoman Empire. “I liked the new perspective,” Anderson said. Makdisi closed with how the current conflicts in the Middle East did not start long ago. “The Middle East, in other words, is not just inheriting age-old religious identities but has also inherited a process of unmaking that began in the 19th century,” Makdisi said.